If you find yourself naively feeding a newly independent eater, fed-up after a few years with a picky eater on your hands, or as the worn-out dictator of a clean plate club, you’re not alone. I hear again and again how stressful it is trying to get kids to eat healthy food. Food refusal. Picky eating. Oral aversions. Food jags. Repeated requests. Whining. Hiding food. It all happens in an attempt to raise a healthy eater. So what’s a mom got to do?! What if I told you that once your child’s plate makes it to the table, your task of “feeding them” is done? No counting bites. No bribing veggies for dessert. No embellished “isn’t this ________ soooo yummy” rhetoric. You decided when the meal was. You prepared the food for that time. You served it where you deemed most appropriate. That’s the complete Clif’s Note version of what a Division of Responsibility in feeding looks like. In this post, we will highlight 5 simple steps you can take to improve the way you manage meal times. These are the first actions you can easily achieve to move toward this recommended approach for feeding. Establishing the Division of Responsibility doesn't happen overnight, however. It takes time and intention to establish a new environment for eating. It requires a renewal of your meal time mindset and what you believe to be true about feeding kids. As you lead your family and assume your "new" responsibilities though, you will see your child adapt and assume their responsibilities in feeding as well. These five steps will help you get there. 1. Draw a line on the table between you and your child. If a visible line serves as a helpful reminder that once you have offered your child their meal or snack, your job is done, then literally tape a line down. Step back and stay on your side of the line. It is not your role or responsibility to invade their side for the sake of actually getting the food inside of them. Allow your child to operate, explore, experiment, and decide how much they eat while on their side of the line. Ellyn Satter gives this rule of thumb: "If you are working harder than your child to get food into her, you are crossing the line" (Child of Mine, 2000). 2. Put your attention and effort towards what you offer, not what your child actually eats. Remember your responsibility rests on when, where, and what food is served. There is plenty for you to focus on when it comes to planning nutrient-dense meals and snacks, accommodating for the developmental abilities of your child, providing variety in the diet, and the associated meal prep for such that it is best not to preoccupy yourself with what stays or leaves your child's plate once "over the line." Your role in a "successful meal time" is not quantified by an empty plate at the end but rather what you gave your child the opportunity to eat. 3. Offer "Love it, Like it, Learning it" foods. To learn more about how Love it, Like it, Learning it works, check out this Beginner's Guide. Most young children benefit from three meals with planned snacks in between. Look at your family's calendar and see what is realistic with your schedule so that opportunities for your child to eat are spaced 2-3 hours apart. Then, structure meals and snacks accordingly so that there are times each day when your child can expect to get to eat. This provides your child enough opportunities to eat and thus remain energized, without the need for you to allow panhandling or unplanned grazing. In order for this approach to be most effective, you need to act consistently with the steps above. If your meal and snack schedule isn't working or needs to be adjusted to accommodate, modify it as needed and verbalize the change to your child. This allows your child to learn how to execute independence with eating; manage their appetite and internal cues for hunger and fullness; trust the availability of food; respect your role and responsibilities as the nutritional gatekeeper; and develop appropriate feeding behaviors consistent with becoming a competent eater. If you have been following me for any amount of time on Instagram, you know I am a big advocate of the #loveitlikeitlearningit approach. This is just one way I have been establishing the Division of Responsibility in feeding our oldest daughter. For us, it has been a practical way to establish this approach on a reoccurring basis, like her lunchbox. Where are you at in this process? I would love to hear comments on if you have started establishing the Division of Responsibility in your own home. If so, what steps do you find the easiest to implement? Which still feel impossible? 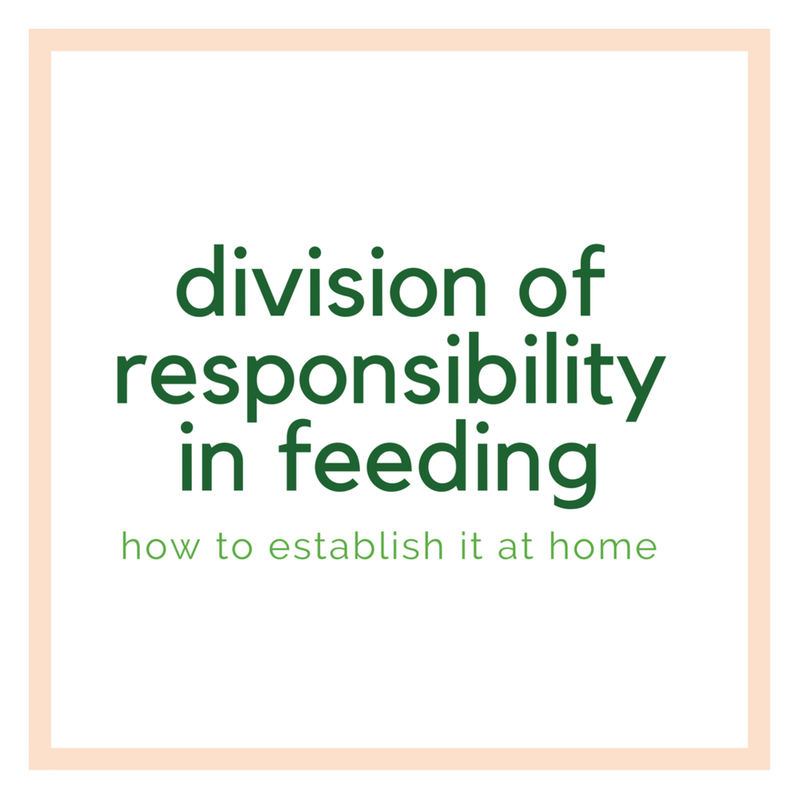 What is YOUR next step to establishing the Division of Responsibility in feeding? Please share your experiences. Together, let’s make this a community that shares our successes and our struggles. In doing so, we will spur one another on towards feeding our kids with creativity and confidence!